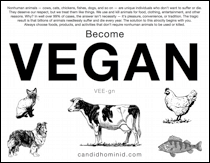 If you are not vegan, I recommend viewing the page on veganism before continuing here. Learn more at the Abolitionist Approach to Animal Rights website, where you can explore a wide variety of essays, books, videos, and podcasts by Gary Francione. Abolitionists seek to eliminate — rather than improve — nonhuman exploitation. They want a world where nonhuman animals are not treated like things or resources. They believe animals shouldn't be used or killed for food, clothing, entertainment, transportation, or any other reason. Many ‘animal advocates’ claim to share this vision, but that alone doesn't make them abolitionists. Our desired endpoint must be in harmony with our tactics. The abolitionist approach argues that many popular efforts are morally inappropriate and practically ineffective. These include welfare reforms, single-issue campaigns, vegetarianism, sexist stunts, racist slurs, and violence. The first and most important step. Not participating in the exploitation of sentient nonhumans is our obligation. It can't be evaded by substituting another action (such as distributing leaflets or signing petitions). Veganism is the moral baseline of the abolitionist movement. Exploitive industries and practices exist because of public support and demand. This is why activists must find creative ways to educate nonvegans. But before doing outreach it's critical that we learn basic theory and prepare ourselves to address common arguments and questions. We can save and improve lives by adopting or fostering cats, dogs, and other nonhuman animals who need homes. They shouldn't have been bred in the first place, but we have a duty to care for everyone who is already here. This can involve operating, donating to, or volunteering at no-kill shelters and sanctuaries. Spaying and neutering domesticated nonhumans benefits their health and reduces their population. Apply these principles to feral cats with TNR (trap, neuter, return).